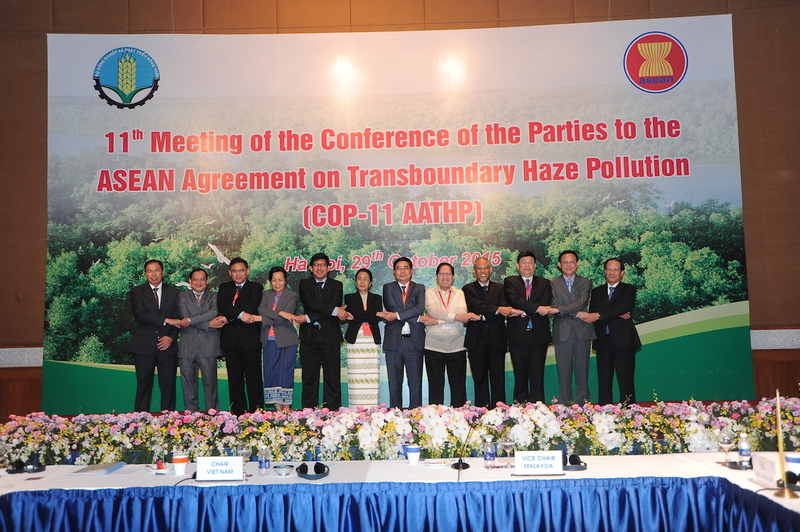 Ministers responsible for the environment from ASEAN Member States (AMS) held their 11th Meeting of the Conference of the Parties to the ASEAN Agreement on Transboundary Haze Pollution on 29 October 2015 in Ha Noi, Viet Nam. The Ministers reviewed regional cooperation on a number of haze-related issues, in particular actions taken under the ASEAN Agreement on Transboundary Haze Pollution, and discussed new initiatives to further promote regional cooperation in addressing transboundary haze pollution. The Ministers expressed concern over the unprecedented severity and geographical spread of the recent smoke haze affecting various ASEAN countries. They also expressed sympathy to the millions of people affected by the haze. The Ministers noted and appreciated the collaborative efforts undertaken by Indonesia, the neighbouring ASEAN countries and the international community to address the forest fires and the associated smoke haze. The Ministers noted the ASEAN Specialised Meteorological Centre’s (ASMC) weather outlook in which the strong El-Nino conditions that currently prevail are likely to extend into early-2016. In the northern ASEAN region, hotspot activities are likely to increase with the onset of the traditional dry season in November/December 2015. For the southern ASEAN region, with the Inter-Monsoon season expected in late October/early November followed by the Northeast Monsoon season in December 2015, an increase in showers activities may help to subdue hotspot activities in region. The ASEAN Member States pledged to remain vigilant and continuously monitor and implement haze preventive measures in anticipation of the strong El-Nino conditions. The Ministers reaffirmed the commitment to the objectives and principles of the ASEAN Agreement on Transboundary Haze Pollution and agreed to step up cooperation to effectively implement this Agreement in its entirety. The Ministers reviewed national, sub-regional and regional activities to address land and forest fires in the region and its associated transboundary haze pollution. The Ministers welcomed the significant progress in the implementation of the Work Programme of the ASEAN Agreement on Transboundary Haze Pollution, including concrete on-the-ground activities such as multi-national cooperation to fight fires; and implementation of the ASEAN Peatland Management Strategy (2006-2020). The Ministers also encouraged ASEAN Member States to enhance bilateral and multi-national collaboration among the ASEAN Member States. ASEAN Member States agreed to share information, subject to respective national laws and policies and international obligations. The Ministers also agreed to institutionalise the possible activation of international assistance by AMS early in the haze season at the appropriate alert level. The Ministers recognized the need for ASEAN Member States to revisit their respective national plan of action (POA) in order to effectively address the land and forest fires that cause haze in the region. The Ministers are committed to develop an ASEAN Haze-Free Roadmap which is an action-oriented and time-bound framework for ASEAN Member States to achieve the vision of Haze-Free ASEAN by 2020. The Ministers endorsed the revised Standard Operating Procedure for Monitoring, Assessment and Joint Emergency Response under the ASEAN Agreement on Transboundary Haze Pollution, where the Alert Levels, Trigger Points and Actions on Fire Suppression adopted by COP-10 was incorporated. The Ministers urged AMS to operationalize the Alert Levels and Trigger Points and Actions to prevent recurrence of transboundary haze pollution. The Ministers endorsed Indonesia’s intention to host the ASEAN Coordinating Centre for Transboundary Haze Pollution Control and further tasked Indonesia to continue to work towards timely establishment of the Centre. In the meantime the Ministers suggested for Indonesia to explore using the ASEAN Coordinating Centre for Humanitarian Assistance on disaster management (AHA Centre) to ensure efficient and quick response towards fire suppression. The Ministers called for ASEAN Member States to utilise the mechanism under the AATHP to mobilise the Panel of ASEAN Experts on Fire and Haze Assessment and Coordination to assess the fire situation on the ground and further recommend the external fire assistance required. The Ministers endorsed the ASEAN Guidelines on Peatland Fire Management, which was developed to serve as a reference for ASEAN Member States in applying holistic Integrated Fire Management (IFM) approach coupled with Community-Based Fire Management (CBFiM) in peatland fire management which includes prevention, preparedness, response and recovery (PPRR). The Ministers commended the significant achievements made through the local, national and regional activities under the 5-year ASEAN Peatland Forests Project (APFP), which was funded by Global Environment Facility (2009-2014) through International Fund for Agricultural Development (IFAD) and implemented by ASEAN Member States in coordination with ASEAN Secretariat and Global Environment Centre. The Ministers also commended the good progress being made under the EU-supported SEApeat Project (2011-2015), which has supplemented support for the APFP and expanded activities to the northern ASEAN Member States. Together, APFP and SEApeat projects have demonstrated the value of integrated peatland management and engagement of local communities and the private sector as well as enhancing peatland fire prevention and warning. The Ministers noted the initiatives by Sub-regional Ministerial Steering Committee on Transboundary Haze Pollution (MSC) countries to take the necessary actions in order to operationalise the ASEAN Sub-regional Haze Monitoring System (HMS). In the meantime, the Ministers encouraged MSC countries to share hotspot areas that cause transboundary haze on Government-to-Government basis. The Ministers responsible for the environment will meet again in 2016 in Malaysia on the occasion of the 12th Meeting of the Conference of the Parties to the ASEAN Agreement on Transboundary Haze Pollution (COP-12).